Turck has further developed its PS series pressure sensors and will offer in future only one universal device with an analog output, which can output both voltage or current signal types. PS pressure sensors with Atex approval are also new additions to the portfolio. The 3GD models can be used directly in Zones 22 and 2. The software of the devices has also been updated. The new firmware version now also includes the implementation of the VDMA menu. The enhanced menu now enables either the VDMA or the Turck standard menu to be selected. Any users can thus find the menu structure that matches what they are familiar with. To prevent operating errors or the intentional manipulation of the sensor, a password request feature has been added to the lock function of the sensors. If a password is programmed in the menu, it must be entered in order to unlock the device. This function thus protects the sensor from any unauthorized manipulation. The pressure sensors of the PS series are available for absolute pressure ranges from 0…1, 0…3, 0…10 and 0…16 bar. 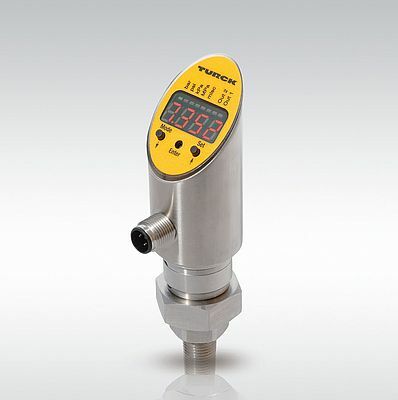 A version with a pressure range from -250 …+250 mbar is available for relative pressure measurement. All PS devices come with an IO-Link interface.